NHL Live Betting Odds Change Often - How You Can Profit! Hey guys, an exciting and profitable way to bet NHL hockey is through live betting. This article will show you how NHL live betting odds change throughout a game, and how you can cash in. For this article, we tracked the Bet365 NHL live betting odds throughout an actual game between the Dallas Stars and Nashville Predators on February 15, 2016. This game was a great example of how NHL live betting odds change because both teams held a lead at one point, there were 2 goals in less than 2 minutes, and it went into overtime. You can really see how something like a goal, a few minutes without a goal or even a power play can have a drastic effect on the NHL live betting odds. We chose to use Bet365 for this article because in our opinion, Bet365 NHL live betting is among the best out there. 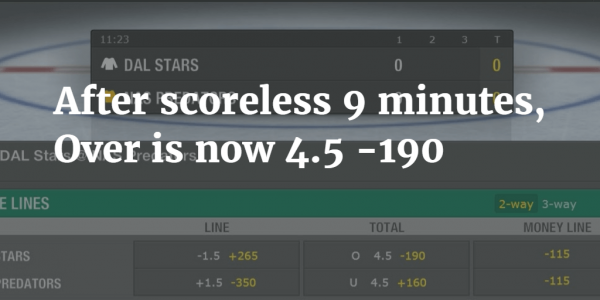 They constantly update their odds throughout the game, not just at intermissions, and their NHL live betting lines have some of the smallest margins in the industry. 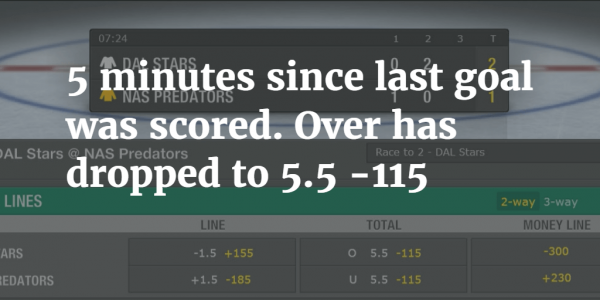 As mentioned, we tracked Bet365’s live betting odds during a game between the Stars and Predators. Below is a breakdown of how the odds changed throughout the game. If you already know who you like to win the game, you’d be better off betting the pregame odds in regular betting, not live betting. Once the game is about to start, Bet365 NHL live betting odds change to a 30-cent structure on money lines and totals (-115/-115 instead of -110/-110). In most NHL games, scoring doesn’t begin for a few minutes. The teams are “feeling each other out” a bit and getting warmed up a bit. But you can see the drastic swing on the NHL live betting odds from no goals in the first 10 minutes. If you liked the Over 5.5 but didn’t want to pay -130 odds, you can now bet Over 4.5 (much more likely to take place) at -190 odds. Nothing makes the NHL live betting odds change quicker than a goal. There’s an average of roughly 5 goals per game in the NHL these days, so 1 goal can be approximately 20% of the scoring. By giving up the first goal, Dallas went from -115 to +175. If you liked the Stars before the game, you can get them at nearly 2:1 odds now. We looked up the Stars’ record when allowing the first goal of the game and they were nearly .500 on the season. Getting 2:1 odds on a Stars win is amazing value! If you think -115 to +175 was a big swing, check out what happens when a team scores 2 goals in less than 2 minutes! Dallas tied the game 7 minutes into the 2nd period, then quickly added another to take a 2-1 lead. 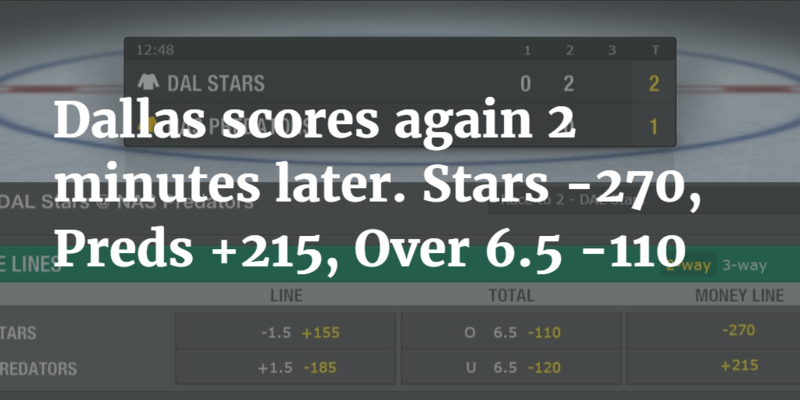 In the span of 5 minutes of real time, the Stars went from +175 underdogs to -270 favourites! Not only did the money line swing dramatically, so did the NHL live betting odds on the Over/Under. 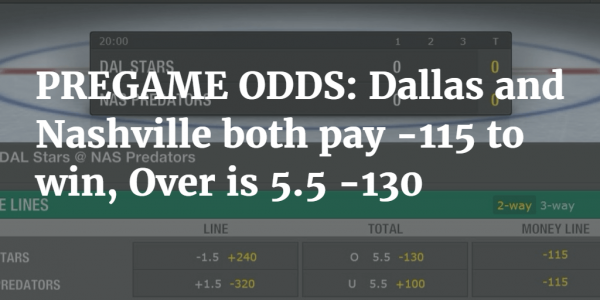 The Over was down to 4.5 at close to even odds before Dallas scored its first goal. After the Stars’ second goal, the Over has shot up to 6.5 -110! 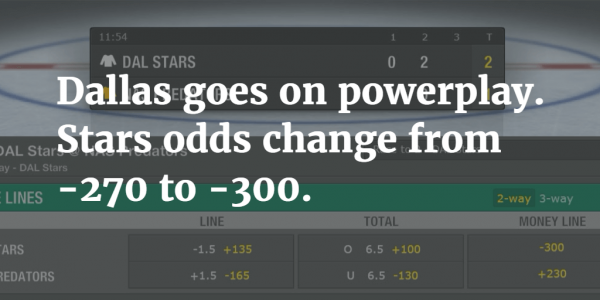 Teams are more likely to score when they go on the power play, so the NHL live betting odds change accordingly. Dallas has a very good power play, and the Bet365 NHL live betting odds moved them ’30 cents’ from -270 favourites to -300 on the money line. 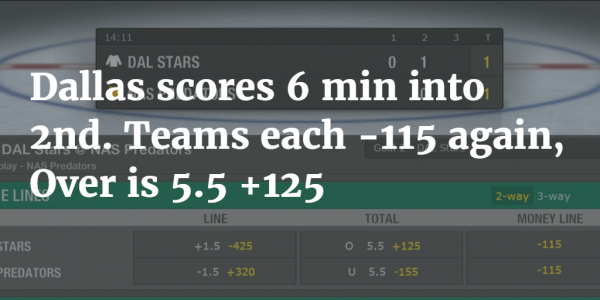 The Stars also dropped from +155 to +135 on the -1.5 puck line. 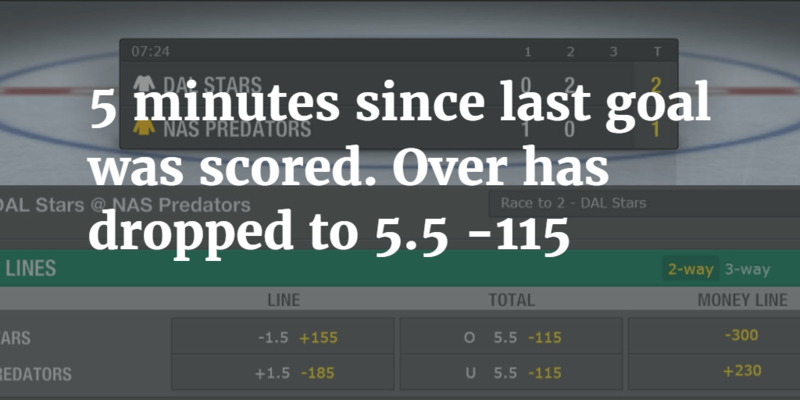 This might be a good time to take the Predators +1.5 -165 and hope they can kill off the penalty, since the +1.5 would cost a lot more when the power play is over. After the Stars’ 2 quick goals, the game settled back down for a while. There were no goals for about a 10 minute span, and that had a huge effect on the Over/Under. Even 5 minutes without a goal was enough to drop the Over from 6.5 to 5.5. If you want to bet the Over in live betting, it’s probably best to wait a few minutes after a goal so that the total drops back down again. In this game, Nashville tied the score 2-2 late in the second period and the teams remained tied throughout the third. 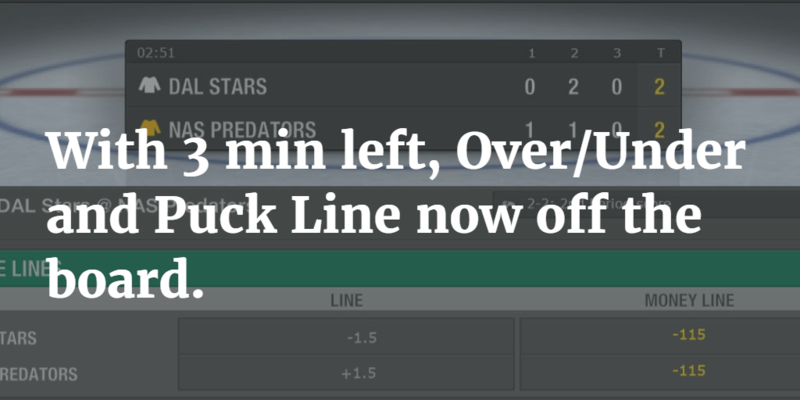 With 3 minutes left to go in regulation time, the Over/Under and puck line are dropped from the Bet365 NHL live betting odds. Especially in a tie game, teams are playing conservatively now and the odds of this game finishing with 5 goals and a 1-goal victory for either team are very high. You can still bet on which team will win the game. In this case, the odds are back to -115 for each team. Once the game goes to Overtime, there’s no drama when it comes to the Over/Under or the puck line. It’s guaranteed that only 1 more goal will be scored, and that it will be a 1-goal game. However, the Bet365 NHL live betting odds change to now offer whether the game will go to a shootout or not, or whether either team will win in OT. You can also still bet on which team will win the game, period. This game opened with both teams at -115 odds, but they’re now each -118 odds now that they’re in Overtime. Crazy how NHL live betting odds change, isn’t it? They don’t fluctuate as often as NBA live betting odds, but when there’s a goal, the NHL live betting odds get turned upside down. If you watched the video, you saw more examples of what the live betting odds were at different points. You could have gotten the Stars as high as +190 during the first intermission, and you could have bet the Over 4.5 at nearly even odds a few minutes into the second period. 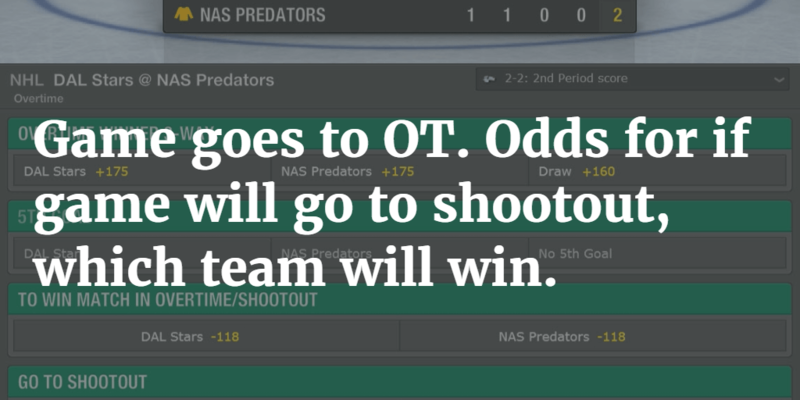 You could have also bet the Predators +1.5 at -165 odds when Dallas was on a power play and leading 2-1. 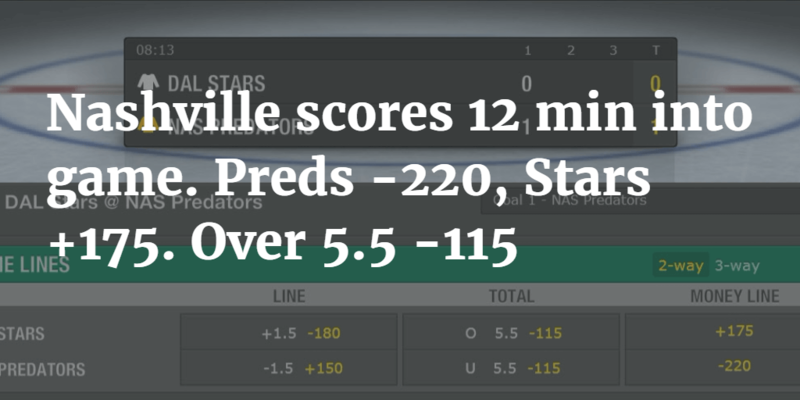 Nashville +1.5 was -320 before the game began, so you can see the great value there. All 3 of those bets would have won, by the way, since Dallas won the game 3-2 in OT. Hopefully you now see how NHL live betting odds change throughout a game and all the value opportunities that can open up as a result. We highly recommend you make NHL live betting part of your hockey betting strategy. You’ll get the best NHL live betting odds at Pinnacle Sports, but they generally only post live betting odds during intermissions. 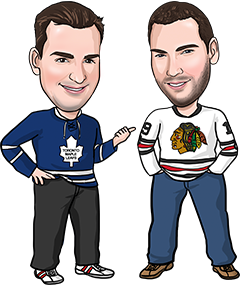 Bet365, Bodog, Bovada (for Americans), Sports Interaction, William Hill and BetOnline all post NHL live betting odds during the action. You might want to join several of them and compare odds during the game to make sure you get the best odds on all your NHL live bets.